UtilX(R) Corporation’s patented next-generation fluid, CableCURE(R)/DMDB, gained another impressive accolade when it passed the California Environmental Protection Agency’s stringent 96-Hour LC50 Acute Toxicity Test. This is the most sensitive and direct test of chemical environmental toxicity in the nation. Materials that cannot pass this test are classified as toxic by California standards. Both CableCURE/DMDB and its predecessor CableCURE(R)/XL are alkoxysilane materials, so their functionality is very similar. However, the same chemical differences that account for CableCURE/DMDB’s environmental friendliness also give it a much higher flashpoint, a lower vapor pressure, faster diffusion within cable insulation, and a less temperature-sensitive solubility curve than CableCURE/XL fluid. Rick Stagi, Vice President of Engineering at UtilX, explains that these benefits extend the range of cables which can be directly injected with rejuvenation fluids. CableCURE/DMDB represents another innovation in cable rehabilitation from UtilX. UtilX has injected more than 125 million feet of power cable with its proprietary CableCURE(R) fluid injection technology, Powered by Dow CorningTM. 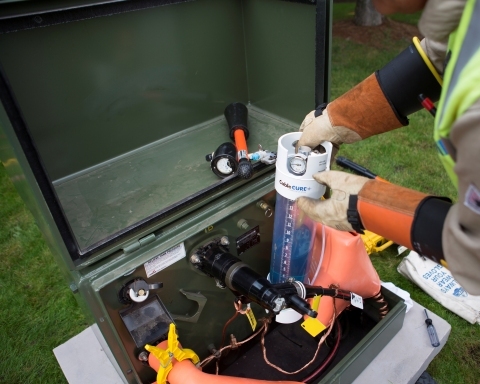 This offering has saved customers an estimated two billion dollars in cable replacement costs. UtilX, a Willbros company (NYSE:WG) , offers its proprietary, patented CableCURE injection service and other reliability and testing services throughout the United States. UtilX also serves international customers through subsidiaries and licensees in dozens of countries on four continents. For more information on UtilX Corporation or CableCURE injection technology, please visit: www.utilx.com or call 253-395-0200 in the United States and (+1) 253-395-4620 from outside the U.S.